Are you looking for a brilliant data-driven marketer, who can incredibly execute data-driven marketing strategies? Yes? Congrats! This post is for you. This post is dedicated to the tips through which you can hire an eligible data-driven market for executing proper data-driven marketing strategies. I’ll also discuss the salary structure of a data-driven marketing professional. Don’t forget, proper implementation of data-driven marketing strategies are not optional any more rather it has become a necessity if you want to make it a big. And without hiring a top-notch data-driven marketer, it’s next to impossible and without knowing the salary structure of such professional, you can’t start planning your next step. So, read the entire post below. It’s true that finding out a capable, eligible data-driven marketer is not easy but it’s not impossible as well. Where marketing is one of the key aspects of business growth, you should also know that modern-day marketing needs a combination of many skills. Hence, it won’t be very wrong to conclude that the modern-day marketer is a unicorn. Each and every employee of your marketing team needs to be multi-skilled and when it comes to data-driven marketing, you should be more careful. I have compiled some useful tips below, helpful for you in finding out your next data-driven marketer. If you are a business owner, then you have surely appointed a couple of software engineer to your company. And we all know how the candidates are analyzed when it comes to a technical post, right? A software engineer candidate needs to go through a number of code tests for the proper assessment for their technical skills and aptitude knowledge, not just only from one programming language. Moreover, some scenario-based questions are also asked to assess your thinking and your reaction to unknown variables etc. Surely, proper designing and development of a product are very important but for whom you’re developing your products with heavy investments? For your target customers, right? If your prospects are not familiar with your offerings or not engaged with your products or services, how can you expect a big success? It’s the marketing team, who communicates with people and draws their attention to your products to generate more and more sales. So, overlooking this segment can result in a big loss to your company. The solution is simple. You have to analyze your marketing candidate just like you test your tech candidate. And when it comes to a data-driven marketer, the analysis should be high enough so that the selected candidate can properly take care of the real-time marketing strategies. As you already know, the present-day marketers must possess strength on more than one marketing aspects. Unfortunately, many companies still hire marketing professionals based on only a couple of interviews or maybe merely through a writing test. Such companies often forget to test the analytical knowledge of the marketing candidates. You’d emphasize on marketing team recruitment or not, it’s completely your choice. But, if you’re very serious about your brand awareness and customer engagement, then you should know the art of “code test” of the marketing team. So, what will be the “code-test” for hiring an ideal data-driven marketing team looks like? Can you tell me the difference between analytics and metrics? Tell me the names of some tools you generally use for measurement and analysis? Likewise, you can prepare different types of customized questions. Remember, it’s an era of implementation. Theoretical knowledge without practical implementation is of no use. You have to win the heart of your prospects on a real-time basis and so what it needs the most is the capability of rapid implementations of marketing tactics to influence people and change their minds. You need the knowledge of delicate balance when it comes to building your modern data-driven marketing team. In times of recruitment of new marketing candidates, you have to look for the proper combination of quality, consistency, and contrarianism in order to achieve that balance. When all team members agree to a point, there’s no scope for friction for different viewpoints. But all disagree to a point, the particular idea can be taken forward. That’s why it’s very important to hire a marketing team, have experience across a huge range of different planes. But, as a whole, they will fall into one of the two categories- the Outliners and the Unbiased marketers. Now, let’s explain the concept of unbiased marketers and outliners. The advanced marketing professionals make strategies on life experiences plus logical thinking and thus they can solve complex problems very easily. The era of simple statement– “We offer …” has gone. Nowadays, people are more interested in searching for some solutions to their problems. So, addressing their pain points should be the first step of your marketing strategy. Literally, “The Unbiased” marketer is unique because they can bring fresh thinking and have a continuous learning attitude- very important for continuously changing marketing trends. These professionals are able to implement the right combination of traditional tactics and advanced marketing strategies. Thus, they can be referred to as a more consistent professional, who wants to completely integrate into the present system and be active as changes take place. In the viewpoint of modern marketing, outliners always crave for the next. Such people live at the edge of technology. They are often the thinkers of years ahead of the present time. Outliners are able to bring new concepts, attitudes, or technologies into your organization. As a result, you can stay ahead of your competitors and accelerate the working speed of your existing marketing team. If you’re really very serious about the marketing of your business and spread the word of your business more and more to people all around the globe, you should hire outliners. Such marketing professionals will be an asset to your company. Their offbeat, out-of-the-box thinking will cultivate some brilliant data-driven marketing strategies, no one has ever implemented before. In simple words, the Outliners live for innovations, different thinking, and offbeat strategies. And a modern marketing team can’t be designed excluding any of them. A solid foundation of innovation and consistency is needed to empower your brand identity and so a fine balance should be there in your marketing team between these two types of professionals. You can then expect a rapid growth of your business. Since more and more companies today have started implementing data-driven marketing strategies into their business, it should be your focus point while hiring candidates. As we all know experience counts a lot. You should ask the candidates how many years of experience they have in working with data-driven marketing. It will help you in choosing the correct fit for your data-driven marketing team. I hope the above tips are sufficient to hire a set of eligible marketing candidates for your business. But, hiring is not enough – to extract the most out of them, you have to arrange some training sessions. Nonetheless, it’s also critical to arrange re-training and empowering sessions for your existing marketing team. After successfully appointing a talented marketer, you need to help him/her to become a powerful marketing leader for future team members. 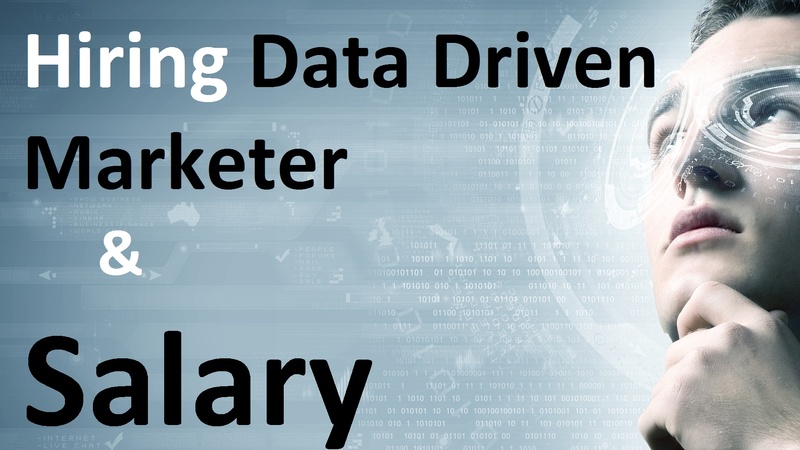 What is the Salary of a Data-driven Marketer? The average salary for a data-driven marketing manager ranges from around $54,865 per year to $128,025 per year. It also depends upon the location and company that’s hiring you! Why does every business need to hire a data-driven marketer? Nowadays, consumers have become very much choosy about the messages whatever they read and also the products they buy. That’s why marketers also have to design personalized messages to grab the attention of more and more customers and retain the attention of existing customers. And you might know that the consumer demand for highly relevant messages has paved the way to an entirely new marketing approach: data-driven marketing. Today, marketers have started collecting data at each and every touch point to better know their customers. They are also interpreting the collected data to predict future behaviors and making real-time marketing decisions. Now, what do you need the most? A strong, efficient data-driven marketing team It would be the main strength of your company. As data-driven marketing strategies have been so critical nowadays, you can’t take any chance with the quality of your team members. It’s a high time to start selecting the best-in-class data-driven marketing experts for your company, based on the above tips. Hurry up! Don’t let your competitors surpass you!